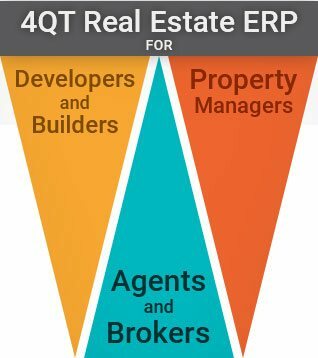 Cloud based or on campus ERP solutions for Real Estate Plot, Villa & Highrise developers. 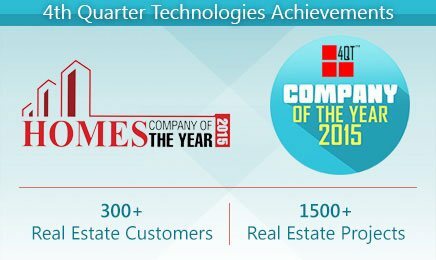 4QT.com is India's Leading Real Estate CRM & ERP software provider. Since 2001, 4QT™ has been developing world-class web software solutions for businesses globally. Our most advanced, internet ready Real Estate Lead Management, CRM, Billing & Sales Management, Construction Purchase/Store Management, Construction Planning, Engineering and Project Management, Legal & Liasoning, Human Resource, Financial Accounting, Rental, Lease and Real Estate Facilities Management ERP Software solution, REALBOOST™ helps Real Estate High Rise, Villa and Plot Developers and Builders manage very large number of Real Estate projects successfully across India. 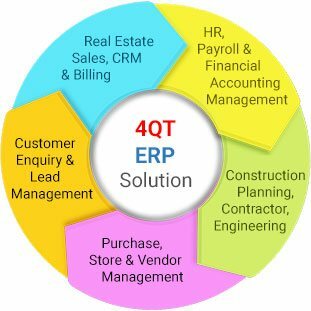 Please contact us and we will evaluate your needs to provide software solutions that meet your business objectives in a cost effective manner. Contractor & Work Order Mgmt. @ What's the need for software solutions for real estate agents? @ How does CRM automise your work? @ Why does website design play an important role in the real estate sector?